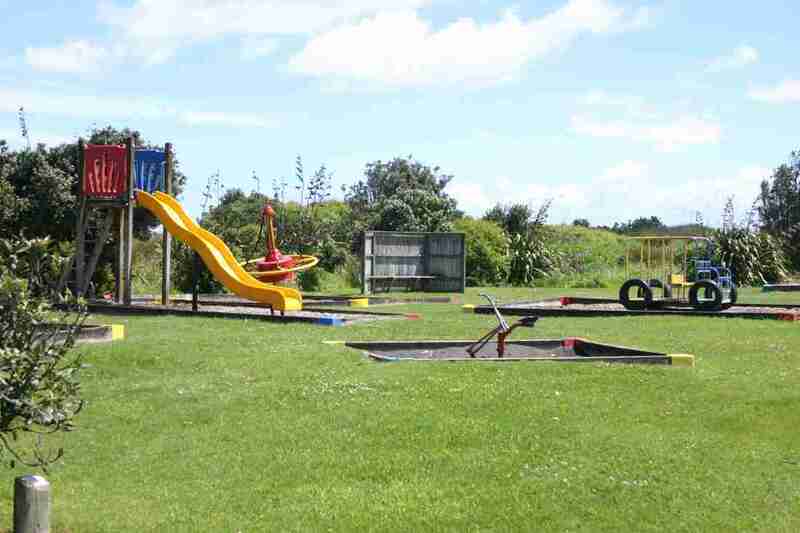 The area on the sea-ward side of Teone street, between the end of Wainui street and the camp ground entrance includes numerous facilities for use by visitors, campers and locals. The grassed area across from the camp entrance is sometimes used as an overflow area for by campers. Located at the northern end of Teone street there is a well equipped children’s playground. Opposite the camp ground entrance a lookout enables views towards the sea. It is also used by campers as a mobile phone reception location. A $2 coin operated BBQ is located next to the entrance to the beach access track. Behind the BBQ shelter is a Petanque ‘piste’. Public toilets and $2 coin operated showers are available at the camping ground.